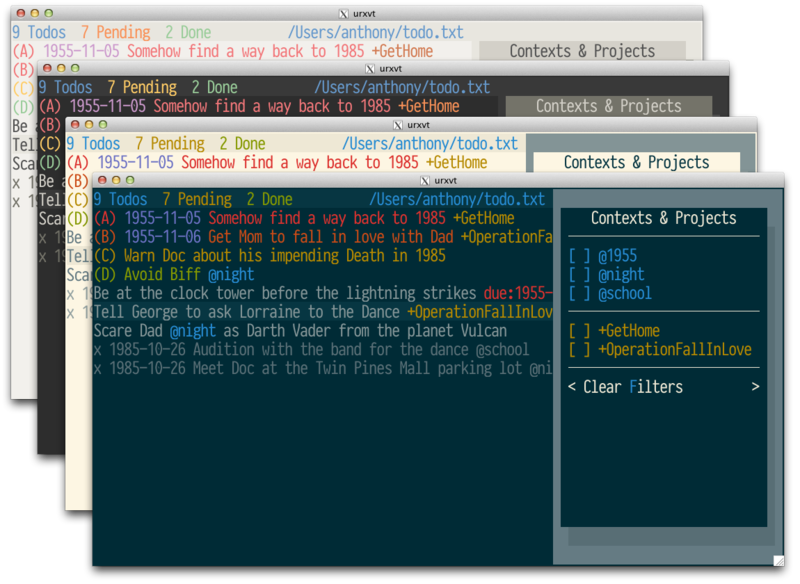 todotxt-machine is an interactive terminal based todo.txt file editor with an interface similar to mutt. It follows the todo.txt format and stores todo items in plain text. Python 2.7 or Python 3.4 on Linux or Mac OS X.
todotxt-machine 1.1.8 and earlier drew its user interface using only raw terminal escape sequences. While this was very educational it was difficult to extend with new features. Version 2 and up uses urwid to draw its interface and is much more easily extendable. Download or clone this repo and run the todotxt-machine.py script. -h --help                           Show this screen. todotxt-machine currently supports solarized and base16 colors. You can add colorschemes by adding sections with names that start with colorscheme-. Then under the [settings] section you can say which colorscheme you want to use. High colors may be specified by their index h0, …, h255 or with the shortcuts for the color cube #000, #006, #008, …, #fff or gray scale entries g0 (black from color cube) , g3, g7, … g100 (white from color cube). You can see all the colors defined here. Let me know if you make any good colorschemes and I’ll add it to the default collection. You can customize any key binding by adding a setting to the [keys] section of your config file ~/.todotxt-machinerc. When you edit a key binding the in app help will reflect it. Hit h or ? to view the help. On Mac OS hitting ctrl-y suspends the application. Run stty dsusp undef to fix. Mouse interaction doesn’t seem to work properly in the Apple Terminal. I would recommend using iTerm2 or rxvt / xterm in XQuartz. Add vi readline keybindings. urwid doesn’t support readline currently. The emacs style bindings currently available are emulated.